In any outdoor setting—beach or backyard, vineyard or mountaintop—the couple has unlimited opportunity to personalize their day and create unforgettable ambience. 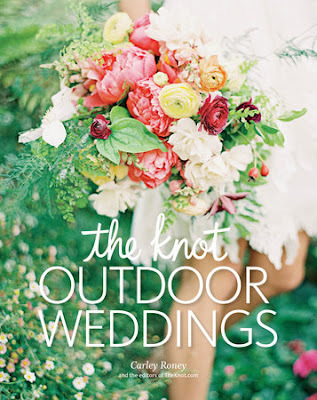 The 50 real weddings featured in The Knot Outdoor Weddings were inspired by twinkling lights and cityscapes, fresh herbs and countryside farmers’ markets, shells and the sea, mountain peaks and endless vistas. . . . These gorgeous celebrations reveal the keys to making the most of your setting’s natural beauty, while infusing it with special, meaningful touches that are all your own. As a wedding planner, I absolutely LOVE outdoor weddings. When my husband and I married(almost 7.5 yrs ago), we litterally got married at the county jailhouse...but I didn't care! All I cared about was that I would be his wife. I get all excited when couples come to me and mention outdoor weddings. This book has all sorts of wedding inspiration & is filled with gorgeous photos and helpful tips for planning an outdoor wedding. .The book was larger than I thought it would be & it has 288 pages, It is 8.3 x 1 x 10.4 inches in height, and weighs 2.7 pounds. The photographs in this book, showcase visually stunning venues adorned with beautiful flowers, centerpieces, and all sorts of decorations. I really love that the book features pictures of real couple’s weddings. The book has great tips for the bride and groom’s big day!